Sir Alfred Herbert's second wife, Florence, died unexpectedly in May 1930, the day before the completion of the legal arrangements for the creation of Lady Herbert's Garden in Coventry. She was buried at Litchfield in a tomb which she later shared with Sir Alfred, and her mother raised a lychgate at the entrance to the churchyard in her memory. The following press cutting (from June Gracey, her step-granddaughter) gives more detail about the memorial and Sir Alfred's improvements to the churchyard. Memorials which have been erected at St James' Church, Litchfield, Hants to the memory of the late Lady Florence Herbert, wife of Sir Alfred Herbert, of Dunley Manor, Whitchurch, Hants and head of Alfred Herbert Ltd, Coventry, were dedicated on Saturday afternoon by the Rev Canon TW Downing, of Knowle, Warwickshire. The tablet is surmounted by a bronze cross. A paraffin lamp hangs in the centre from the roof. On the churchyard side of the gate appears the words "Depart in Peace". 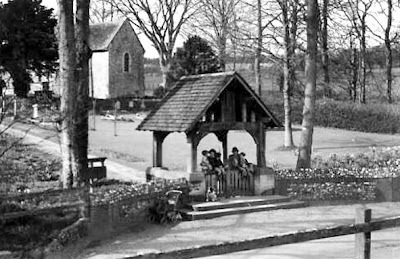 One feature of the design is that the lych-gate has been set back from the road, which permits of more safely for worshippers leaving the church, the road past being a particularly busy one [sic]. It also allows a car to draw up comfortably without obstructing the road. Besides giving the churchyard wall and path, Sir Alfred has greatly beautified the churchyard in many ways. One side has been completely opened out, decayed trees removed, and hundreds of bulbs planted in the grass. Another typical work of Sir Alfred has been to ascertain the number and names of children buried in the churchyard, without monumental recognition, and he has erected a headstone on which all the names of those children have been inscribed. The lych-gate on Saturday was surrounded by a wealth of spring flowers, and daffodils, primroses, hyacinths, lilies-of-the-valley and suchlike flowers abounded in the churchyard, which was a perfect picture of beauty, whilst the day was most genial, the sun shining brilliantly while the clergy and large congregation gathered for the dedication ceremony. The immediate members of the family present were: Sir Alfred Herbert, Mrs Pepper, Miss Blanche Pepper, Miss Margaret Pepper, Masters George Blyth and Gerald Egan, Miss Betty Price, Captain and Mrs Hollick and Master Ian Hollick, also Mr Albert Herbert FRIBA of Leicester, (the archictect responsible for the scheme), who is a cousin of Sir Alfred Herbert. There were also present several members of the Coventry firm, including Mr Oscar Harmer, Mr J Pickin, Mr D Grimson (Directors), and Mr H Grinyer (London). A short service in church preceded the dedication.